I generally consider myself to be a sane person – I buy my groceries over the weekend so that I can prep my meals for the week, I invest a small sum monthly to save up for a rainy day etc. However, when I came across the P50 Lotion, it’s safe to say that I lost all my senses. It didn’t help that my beauty-obsessed colleagues egged me on to spend a chunk of money on a single skincare product. In our defense though, this baby has been touted as a miracle in a bottle and has several celebrities raving about its powers. 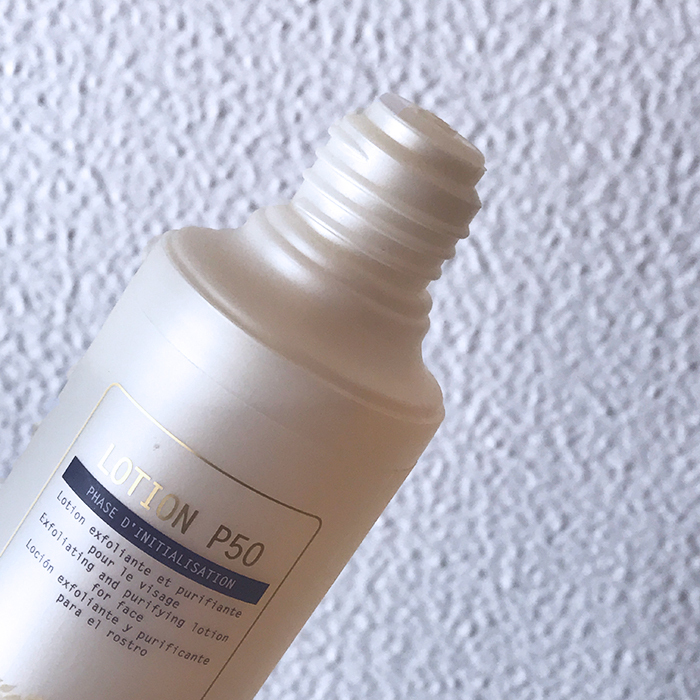 So, without further ado, here is my review of the Biologique Recherche P50 Lotion. Considering that the price point puts this product firmly in the luxury category, the packaging is surprisingly low-key. The product comes in a plastic bottle with a screw-on cap. Unlike several other skincare products, this one does not come with a pump or dropper. Instead it has a hole at the top that dispenses drops uniformly, without spilling any of the precious liquid inside. The ingredients and directions are printed on the back of the bottle. Before we get to the main stuff, let me just tell you this – P50 is not a lotion! If you are expecting a thick, creamy product, then the watery consistency and clear colour of the product will shock you. However, there’s no need to overdo the application, as a few drops is more than enough to cover your face. Also, fair warning – this stuff tingles! When I first began using it, my face would burn for a few seconds and turn slightly pink. The scent is also not very pleasant (probably due to the presence of onion extract), but it does dissipate quickly. Since I bought the P50 Lotion from a registered spa, I followed the directions of the aesthetician and used it twice a day. This turned out to be too much for my skin, as it turned dry and flaky. Now, I’ve found my sweet spot by applying it only at night. Whilst some prefer splashing the lotion directly on, I add a few drops of it to a dry cotton pad. For best results, do not swipe the pad but press it into your skin instead. Those with drier complexions should use a moisturiser about 20 minutes after using this lotion. Now for the best part – the results! Although my bank account isn’t happy, this product has been a game changer for my complexion. The lactic acid and niacinamide have worked amazingly to lighten the pigmentation around my chin in just about 2 weeks. I’ve also noticed that if I apply a tiny bit to an active zit, it comes to head practically overnight. My boyfriend even asked me if I’m wearing highlighter because my complexion was glowing! The only thing I was disappointed about was that the tingle faded away after a few days – a fact which does not bode well with my ‘no pain, no gain’ policy. However, after emailing the spa, I found out that this means my skin is getting balanced! So, I guess there really are no negatives. If you are looking for an more even-toned, brighter and smoother complexion, this baby is definitely the one for you. Whilst it’s notoriously hard to find, the hunt is well worth it. Now, excuse me whilst I convince someone to gift me a bottle every year!